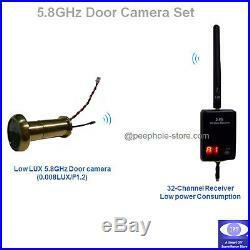 This is a set of 5.8GHz Wireless Door Peephole Camera and Receiver for you to build a Home Door Safety Surveillance System. This 5.8GHz Wireless surveillance system can avoid the signal interference from the over-crowded 2.4GHz signal nearby. This 90 degree viewing-angle Door PeepHole Camera is a high-end 720×480 pixels CMOS sensor with an extremely low illumination of 0.008LUX. The door camera is built with an ultra-mini sized connector for connecting to the included a 5 meter-long ultra-thin wire. 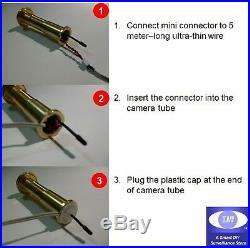 The mini connector can be hidden inside the camera tube with a plastic cap. The mini connector and ultra-thin wire accessories allowing you keep your door with a great looking without showing undesirable bulky electrical wiring on door. 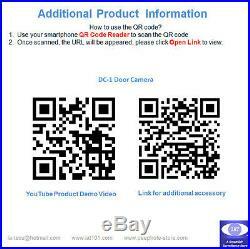 5.8GHz Wireless 90° Angle Low LUX Door Camera Door Peephole Camera & 32-CH Receiver (Brass Color Door Camera). 2.4GHz RF Product. Door Peephole Camera Compariso. 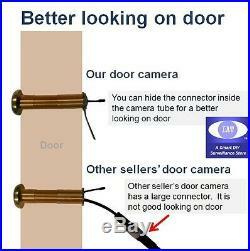 You may found similar door cameras from other sellers, and their cameras come with a big electrical plug with no wire provided which is not a clean-cut design solution to install a high-tech product with an ugly look on door. Please check the size difference between our mini connector and their big plug. 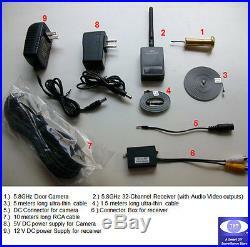 The 5.8GHz Receiver is a 32-Channel selectable high-end receiver. It has both Audio and Video output ports. You may connect one video output to TV, or to a DVR for recording. The low power consumption receiver has following features. 32 Channels: Cover A, B, E bands and F band (Airwave band). A witching button for two digital display: a long press on button for frequency bands switching; a short press on button for frequencies channels switching. The wiring diagram of a 5.8GHz door camera is showing in following. For detailed product specifications and the wire length calculation for your door, please refer to Additional Product Information. 5.8GHz Door Camera. 5.8GHz 32-Channel Receiver (with Audio Video outputs). 5 meters long ultra-thin cable. 1.5 meters long ultra-thin cable. DC Connector for camera. Connector Box for receiver. 10 meters long RCA cable. 5V DC power supply for Camera. 12 V DC power Supply for receiver. (we will provide correct power plug match your country plug). 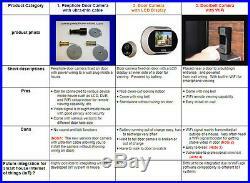 Wireless Door Camera Product Specifications. NTSC: 720 x 480; PAL: 720 x576. 0.008 LUX / F1.2. Lens / View Angle. 0.5mm F1.2 / 90 degree. Door hole size: 14mm. Door Thickness: 38 -60 mm. ISM Band: 5.8GHz. 1.0 Vp-p (75ohm). 1.0 Vp-p (10 K-ohm). 80 x 65 x 15 mm. Receiving 32 Channels: Cover A, B, E bands and F band (Airwave band). Calculation of the ultra-thin cable Wire Length. It is okay for a P. Australia, Most of Asia countries. USA, UK, Canada, Most of Europe countries. 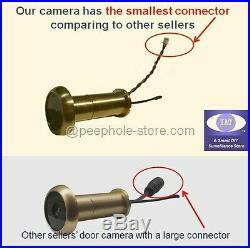 The item “5.8GHz Mini Wireless Peephole Door Camera & 32 CH Hidden Spy Receiver NTSC PAL” is in sale since Sunday, February 23, 2014. This item is in the category “Consumer Electronics\Surveillance & Smart Home Electronics\Home Surveillance\Security Cameras”. The seller is “iat101″ and is located in Worldwide Shipping. This item can be shipped worldwide.